Honeybee colonies encapsulate the nature of complex systems with staggering loveliness. 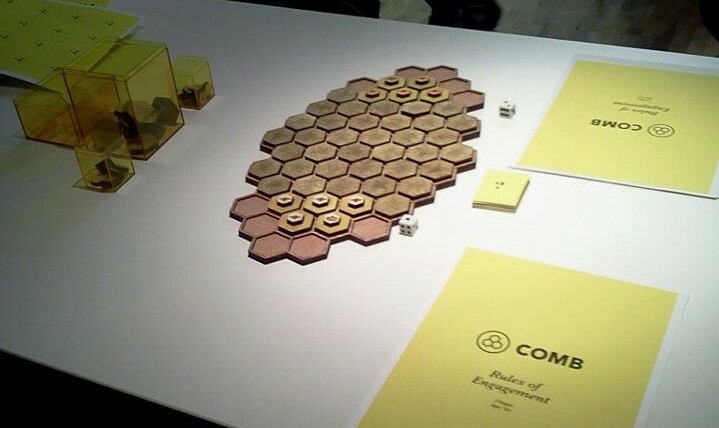 This board game, a strategy game with elements of both chess and checkers, employs mechanics that capture the physicality, subtletly, and fragility of a beehive. with Joe Kwesiga, Josh Treuhaft, Sara Cornish, and Meredith Lanoue, 2013. Made of lasercut luan. This ‘big game’ questions the role of unmanned drones in foreign and domestic policy, exploring tensions between citizens, governments, and perceived ‘others’. As perceived threat levels rise, players must act on limited information to best protect themselves and others. The full game rules can be found here.